This story was updated Oct. 29. HOUSTON ? To call NASA's Robonaut 2 the silent type would bean understatement. The first humanoid robot headed for space is no chattyC-3PO. In fact, when two red-shirted NASA handlers rolled R2 ? short forRobonaut 2 (not R2D2) ? into the press area here at Johnson Space Center, theprocess was so quiet I didn't even notice. The robot's "tucked and ready for launch" positiononly exacerbated the effect. With his bulky arms pulled into his chest, R2seemed ready to throw a punch. But Robonaut 2 isn't a fighter. The robot, developed by NASAin partnership with General Motors, is designed to help astronauts with choresand repairs aboard the International Space Station. NASA plans to launch R2 tothe space station next week aboard the space shuttle Discovery, along with sixflesh-and-blood astronauts and a cargo pod that eventually will be used as acloset on the orbiting lab. This Robonaut2 graphic gives you a glimpse of what the robot is expected to do. According to developer Rob Ambrose, the acting chief of theAutomaton, Robotics and Simulation Division at Johnson Space Center, makingsure Robonaut2 can't hurt anyone was the primary goal of the development team. "When a person steps in the way and interferes with it,nothing dangerous is going to happen," Ambrose told reporters Oct. 21. "The robot will just pause. And if you hit it really hard, it will turnitself off." 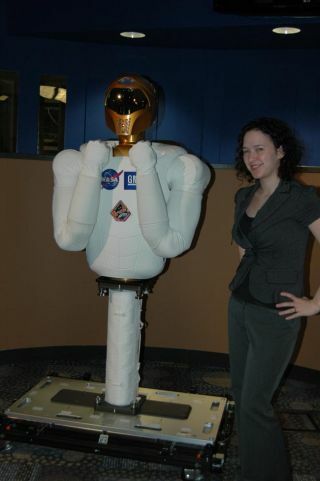 In fact, the model I met was a prototype, Robonaut 2A. He ismechanically identical to Robonaut 2B, the version that's packed and ready forthe launch. The only things different, his handlers told me, are the materialshe's made of. Materials are important aboard the space station. They can'tbe flammable, for one thing, so Robonaut 2A's soft Lycra and neoprene coveringwas replaced by fire-resistant spacesuit material for the ISS-bound model. Someof the R2B unit's electronic components are space-friendly, as well. Anything going aboard the space station also has to beodor-free: That new-car smell of off-gassing plastics might be appealing onEarth, but in the enclosed chambers of the space station it doesn't fly. To make sure the emission of gases wouldn't be an issue,R2's developers took him to White Sands Test Facility in New Mexico and bakedhim in a giant oven for four or five days. Then they ran the air in the oventhrough a mechanical sniffer to make sure it was clean. They're also working on givingthe robots wheels so they can one day roam the moon or explore distantplanets. For now, both R2 models are stuck in place on aluminumposts. From that vantage, R2A stood stoically last week as Ambrose showedvideos of the robot lifting weights (humans are stronger and faster, Ambrosesaid, but the machines beat us in endurance) and moving its arms in graceful patterns. Before Robonaut 2A was wheeled out of the room, I camecloser to peer into his dark visor. "He doesn't bite," a handlerpromised. I didn't tell him I was more concerned about somehowbreaking the $2.5 million machine, but I did ask if I could touch R2A. Permission granted, I squeezed the robot's bicep. It feltlike a cross between a memory foam pillow and a well-muscled human arm. He may not be much of a conversationalist (except on Twitteras @AstroRobonaut), but I can see the appeal of having the strong, silent typearound to do the tedious work of space exploration. SPACE.com is providing complete coverage of the lastvoyage of space shuttle Discovery. Click here for missionupdates, new stories and a link to NASA's live webcast coverage. Stephanie Pappasis a Senior Writer for LiveScience,a sister site of SPACE.com.